… after Joel Roberts Poinsett, the first United States Minister to Mexico, who introduced the plant into the US in 1828. … The plant's association with Christmas began in 16th century Mexico, where legend tells of a young girl who was too poor to provide a gift for the celebration of Jesus' birthday. The tale goes that the child was inspired by an angel to gather weeds from the roadside and place them in front of the church altar. Crimson "blossoms" sprouted from the weeds and became beautiful poinsettias. … there is a common misconception that the poinsettia is highly toxic. This is not true; it is mildly irritating to the skin or stomach and may sometimes cause diarrhea and vomiting if eaten. Sap introduced into the human eye may cause temporary blindness … This misconception was spread by a 1919 urban legend of a two-year-old child dying after consuming a poinsettia leaf. While it is true that the plant is not very toxic, those sensitive to latex may suffer an allergic reaction and it is therefore not advisable to bring the plants into the home of sensitive individuals. As long as you avoid wiping your eyes with the leaves or serving them up in a salad, it should be possible to enjoy these colorful plants in your home. Image: Paxton's Magazine of Botany and Register of Flowering Plants, vol. 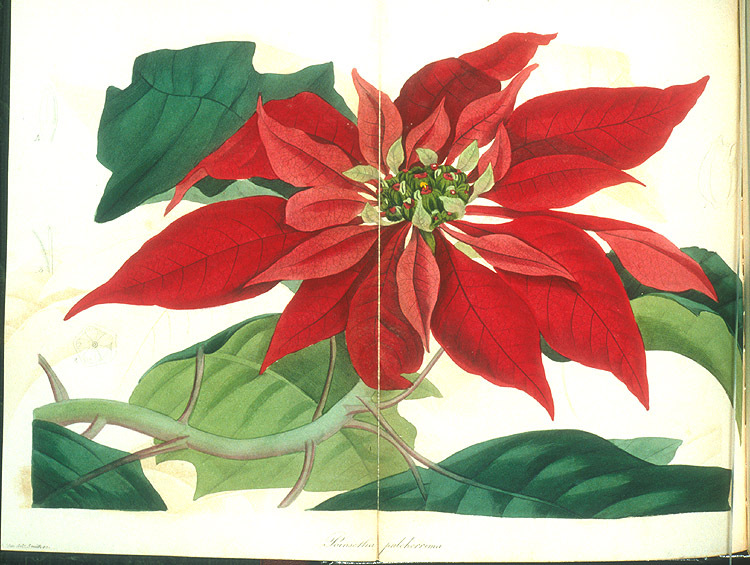 4, 1838, Poinsettia pulcherrima.